Once on Facebook enter your email address (this is the one you used when you first signed up) and then the password. If you want Facebook to keep you logged in at all times then make sure to check the box Keep me logged in. If you don’t want to be logged in at all times and wish to enter your email address and password every time you log-in then uncheck this box. Also, if you forgot your password, don’t fret! Simple click on Forgot your password? And Facebook will send it to you. As crazy as it sounds, logging out of Facebook is not as evident as you would think, especially when you are new to the site. In this video I’ll walk you through how to Log-in and out of Facebook. By logging in and out of Facebook you are actually taking extra measures to keep your account safe. 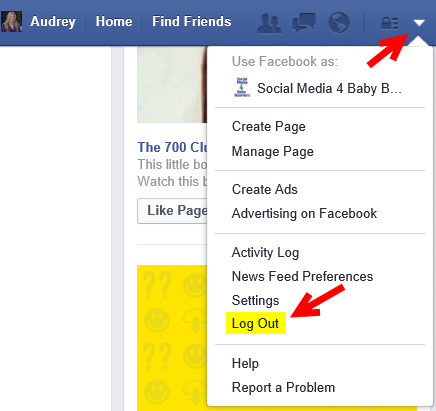 To Log out of Facebook simple click on the down arrow located at the top right of your account. Choose Log out and you are done. Great program, Audrey you are doing an outstanding job I can fully comprehend everything you’re doing. It looks like you’re having a lot of fun anyways.